Oct. 26, 2014, 7:03 p.m. The New York Times Company and German publisher Axel Springer are collectively investing €3 million ($3.7 million) in Blendle, a Dutch news startup where readers pay by the article, Blendle announced Sunday. Klöpping declined to say how much each company was investing, only that the total was €3 million. Axel Springer, which is making the investment through its venture arm Axel Springer Digital Ventures, also wouldn’t say how much it’s investing. The Times didn’t respond to a request for comment. Blendle launched publicly in May, and the site has more than 130,000 registered users. Publishers set the prices for how much each of their articles cost, and keep 70 percent of the revenue generated from those stories. Blendle takes the other 30 percent. Dutch start-up Blendle receives 3 Mio. EUR in a Series A financing round from The New York Times Company and Axel Springer Digital Ventures to help the company accelerate its international growth plans. 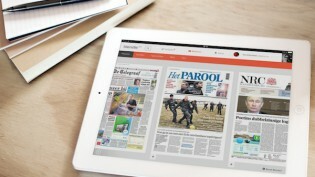 Blendle operates a digital kiosk (blendle.nl) selling individual articles from newspapers and magazines to internet users. The company was founded in 2013 by two 27-year-old former journalists, Alexander Klöpping and Marten Blankesteijn, and launched its service in the Netherlands five months ago. On Blendle people can discover and read articles from practically all Dutch newspapers and magazines, only paying for the individual articles they read. On average an article costs 20 cent on Blendle. The pricing per article is set by the publishers and revenues are split 70:30 between the publisher and Blendle. Today Blendle has more than 130,000 registered users and plans to use the funds to roll-out its service to several European countries within the next two years. “As a publisher we want to convince users to pay for great journalism; also in the digital age. I’m therefore delighted that a European startup is building a platform for paid access to quality journalism that is easy to use. Blendle has the potential to attract young, internet savvy readers,” says Mathias Döpfner, Chief Executive Officer of Axel Springer SE. After the investment the two founders will continue to fully control the company representing more than 75% of Blendle’s share capital. The new investors will not have any insight in the Blendle sales numbers of other associated publishers and their affiliated newspapers and publications will not receive any preferential treatment and will contract with Blendle on an arm’s length basis. Lichterman, Joseph. "The New York Times Co. and Axel Springer are investing €3 million in Dutch startup Blendle." Nieman Journalism Lab. Nieman Foundation for Journalism at Harvard, 26 Oct. 2014. Web. 18 Apr. 2019. Lichterman, Joseph. "The New York Times Co. and Axel Springer are investing €3 million in Dutch startup Blendle." Nieman Journalism Lab. Last modified October 26, 2014. Accessed April 18, 2019. https://www.niemanlab.org/2014/10/the-new-york-times-co-and-axel-springer-are-investing-e3-million-in-dutch-startup-blendle/.